Just as Saint Damien and Saint Marianne ministered to the hungry, homeless, despairing, lost and forgotten here in Hawaii, so today the Catholics of the Diocese of Honolulu continue to reach out to everyone regardless of where they are in their journey of life. We do this through our parishes, schools, social and healthcare services. Hawaii Catholics walk with all as brothers and sisters, together in our struggles and our triumphs, while facing a future not yet written. Through the gospel of love we invite all to come and know the incredible, infinite love of Jesus Christ. Today there are 66 parishes and 23 mission churches ministering to Catholics on six islands within the boundaries of the Diocese of Honolulu, making it "a diocese like no other, " as stated by Bishop Larry Silva in the Diocesan Road Map for Pastoral, Program and Facility Needs 2008-2013. We invite you to experience this uniqueness by exploring this site, by visiting one of our parishes or schools, or by taking part in any number of social, pastoral or educational ministries. Let us travel together on this journey to give Witness to Jesus. "Gules; a cross gyronny throughout Argent and Azure, in the second and third quarters a traditional Hawaiian kapa ball Argent on a staff issuant in base Sable. The shield is ensigned with a precious mitre Proper". 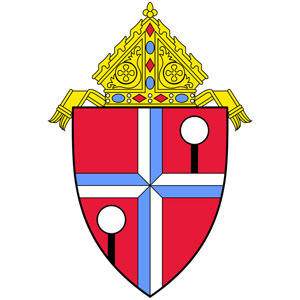 The arms of the diocese is depicted as a cross of episcopal authority representing the faith planted by the early missionaries in Hawaii, quartered on a field of red, chosen because it was the dominant color on Hawaii's coat of arms. The order of colors from upper left to right is red, white and blue, the colors of the Hawaiian flag. The cross is quartered in white and blue, the colors of Our Blessed Mother, the diocese's patroness under the title Our Lady of Peace. In the seconds and third quarters stands a white kapa ball on a black standard, an ancient Hawaiian ceremonial symbol indicating protection or a place of refuge, derived from the Seal of the Territory of Hawaii at the time the diocese was established in 1941.